Hi All, this is Aswathy. Glad to be part of this group. I am also looking for pre kg admission for my daughter.Thank you. Iam attaching two screenshots from the previous years thread, which would help all to understand the admission process. Many thanks to the Gentleman who wrote this for the benefit of all. Hi All, This is Raji from valasaravakkam, i would like to know is there any rule about distance limitation from school to residence in the PRE-KG admission in PSBB KKNAGAR? Hi all , this is SUDHAKAR, i want to admission to my son for LKG, But age as in 22.01 2019 he complete 3 years and as of June 1st he is at 3 years 5 months old ... Kindly suggest me these age criteria...is it possible for LKG or UKG only possible?? @ Raji Madam - no one is clear on this distance criteria as the school has never said this explicitly. Although in all previous forum discussions, 1Km was mentioned by parents and not by the school. @ Mr. Sudhakar - extrapolating from last year's admission notice, for admission to this year's Pre Kg the kid should be born between 01/12/2015 and 30/11/2016. From this I infer that your child would be eligible for Pre KG itself and not LKG or UKG. I am looking to admit my son in PSBB Prekg in 2019. Schools connect website says forms will be given out in the month of January.I rang up the school and they said its all done online only & in the month of Feb 2019. 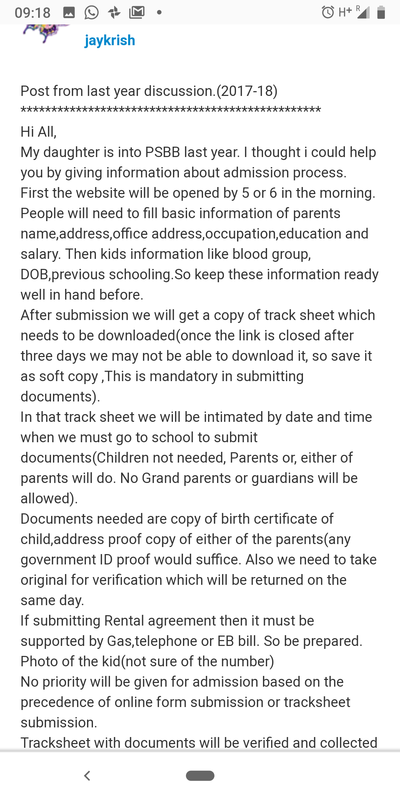 From Jaykrish's post, I understand we can submit address proof of either parent. I am planning to submit my driver's license as address proof. I agree. There is no concrete info on distance criteria or whether going to playschool is a mandate. I have also heard of kids who did not go to playschool getting admission last year. Thank you for the 2018-19 thread! I am currently based out of Bangalore but have permanent residence in Chennai. 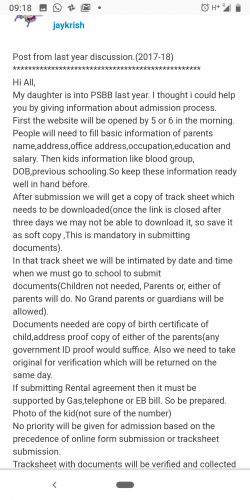 Would anyone know if one has to show that they are employed in Chennai to apply for admitting their children? Rajaraman from West Mambalam. Glad to join this group. I'm looking for my son admission in 2019-2020. Looking forward for updates. Play school is not mandatory, but for Pre-kg itself they have an interaction rounds, they testing the students can able to tell the colors, vegetables , animals , birds and all, We have interacting round for my son in PSBB DLF city (Thalambur) where they asked him for shapes rhymes and all, if you kid is able to answer without going Pre school well and good. I am a sibling parent. 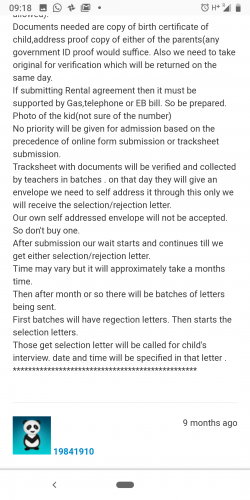 The above snapshot of admission procedure was drafted by me for my elder daughter.Happy be part of this discussion.will provide information that I know. Preethy Madam Thank You for all the help. We shall all be probably depending a lot on your help. Madam, this is sudhakar, i can't find any snapshot in respect of admission procedure... Kindly upload once again .. This is Arthi. We currently reside in New Jersey. We are planning to shift to Chennai. We are seeking admission for twin boys. Thanks for this informative thread and I look forward to gain more information regarding the same in near future. Happy New Year to all. Am looking for my kid's Pre-KG admission in PSBB. Any idea on the date for admission in Jan'19? Based on age criteria, your daughter would be eligible for LKG. But admission happens at PSBB is for PreKG. For other classes it depends on availability of seat if someone leaves the school etc. You can enquire at the school. Hi All, This is Suresh from KK nagar, My daughter also turning in to as 3 yrs on March month,looking for admission on PRE-KG on PSBB. thanks for the threads...plz keep on post it..
Just re confirming, is it enough if I submit address proof of either mother or father ??? Is income proof like pay slips requested during admissions? in that case do they ask for salary slips of both parents if working?